I remember Evelyn as such a dedicated wife, and a loving aunt. She May not have had children of her own, but we were glad to be her children when we visited her. Eb May have been strict and demanding, but those qualities weren’t punishments to me, they were life lessons I’ve kept with me my entire life. I thank her for it. I love her for it. Eb gave me a heart bracelet when I was younger–a bracelet she wore that I expressed admiration for–and it represents much more than a piece of jewelry. It is a treasured memory I will always love. RIP Eb. I have such fond memories of Evelyn. I was fortunate enough to get to spend alot of my childhood around Evelyn. I remember so many card games that she and all of her sisters played over the years. Those were great times. They were all so close to be such a large family. Evelyn never had children but she could always remember all of her nieces and nephews and their children and kept up with so many dates and events of all of her family. I will really miss her May she rest in peace. We always had a fun time around our “Aunt Ebb” as we used to call her. My daddy and she would argue like cats & dogs when they played cards. She used to really yell at anybody that used to bump James or Milton when they were racing at the speedway.When we were kids, we used to call her house just to hear her say”alright”, she never said hello until years later. 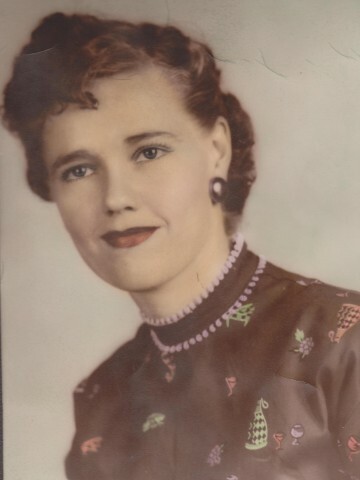 I always remember her good country cooking and how she taught me how to add a sprinkle of salt when making coffee, she said it took out the bitterness. She could work a TV Guide puzzle like no one I know. As kids we all liked to be around Ebb and James. God Bless Her. No more pain for Ebb! She will be with her loved ones who have gone before her to watch over us! Until we meet again Ebb! I love you!